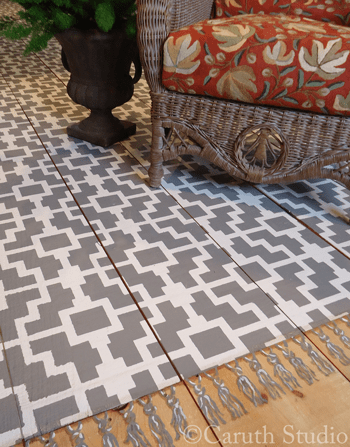 If you’ve got a space for an area rug that’s larger than your wallet, create a faux rug with paint. It’s the ideal solution for a damaged, stained, or high-traffic floor, and it’s easier and cheaper to clean than a large rug. For the cost of some basic supplies and a stencil, you can get the custom size and look you want. 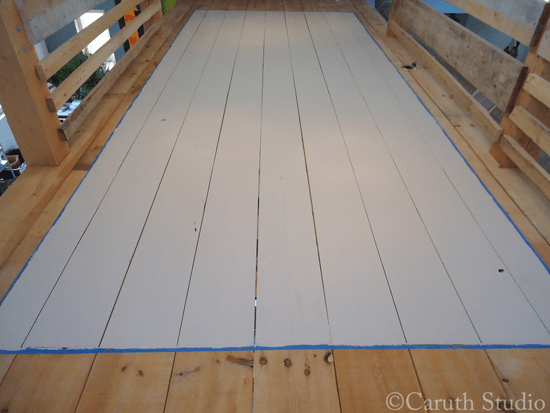 For the most durable results, use a paint specially formulated for coating floors or porches. 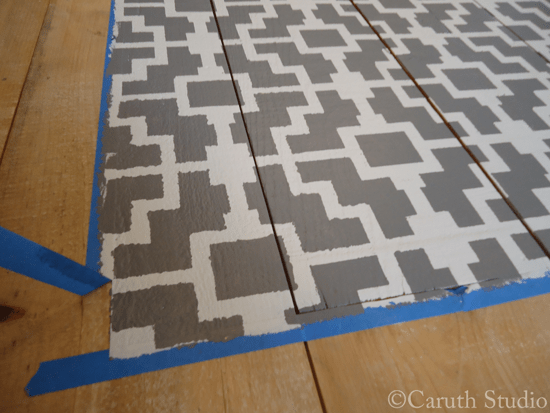 Using painters’ tape, mask off the rug area. Roll on primer and let dry. Roll on background color for your rug. 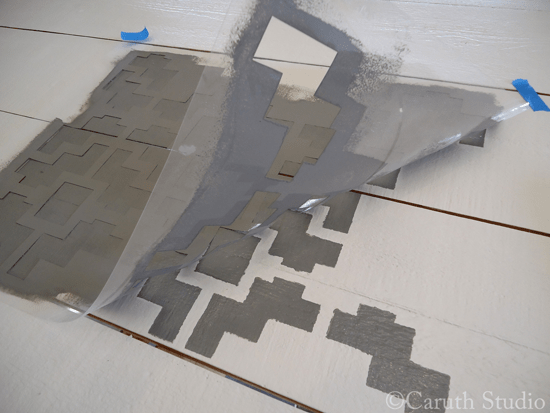 (It is usually easier to stencil a darker color over a light background.) 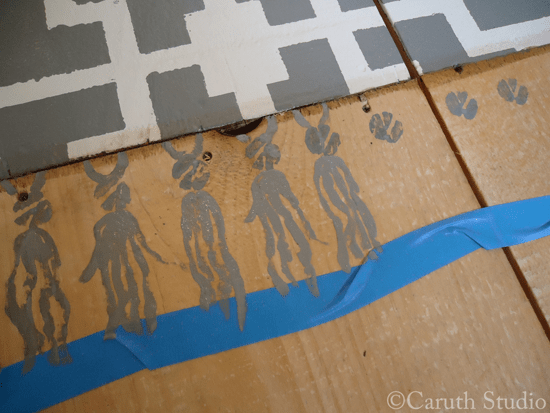 Once dry, tape your stencil in place or use a stencil adhesive. Depending on your stencil design, begin in the center and work your way out to the edges. Dip a small amount of paint in a tray or paper plate. 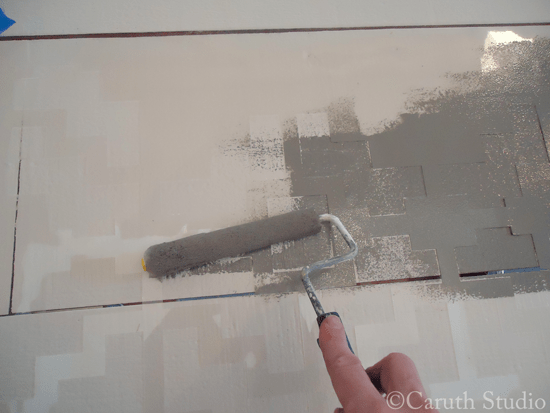 To keep paint from bleeding under the stencil, try not to overload your roller. 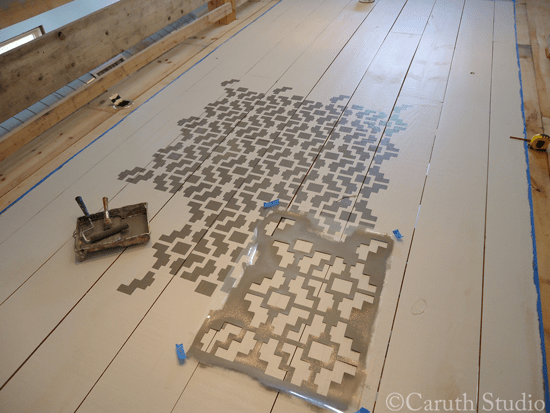 Lightly roll the stencil overall. Roll over the stencil again until you have full coverage. Carefully lift stencil and let the first impression dry to the touch to avoid a smear. Alternating from one end of your rug to the other gives the previously painted area time to dry while you’re working on the other end. You may need to clean your stencil periodically to maintain a crisp edge on the design. Once complete, remove tape and add embellishments if desired. A subtle drop shadow lightly painted around the edge of the rug adds to the illusion of depth. For the most natural look, use a paint color slightly darker than the color of your floor and thin it a bit with water. A painted rug with straight ends is uniform and formal; add tassels by hand for a more casual look. Making a hand-painted tassel is as simple as carving a potato. 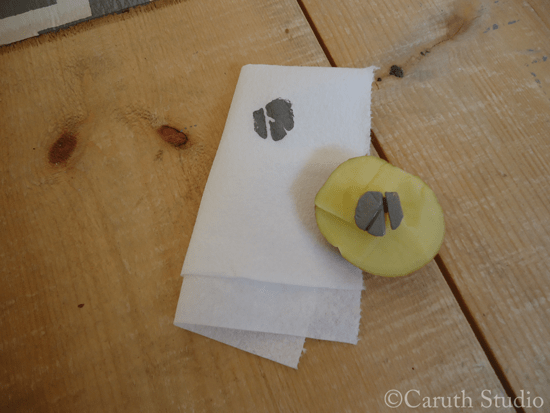 Cut a potato in half and carve away from the cut surface to create a raised “knot” design. 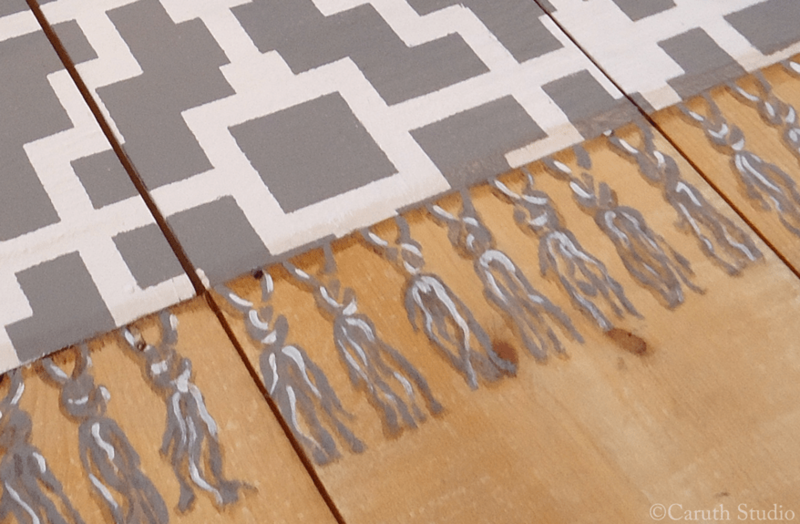 Dip the carving into the darker color of paint and stamp a row of knots along the top and bottom of your rug. From each knot, paint a few strings of yarn. Using the lighter color of paint, add highlights to the knots and yarn stands. For a finishing touch, paint drop shadows using the same color you thinned for the edging shadow. TIP: When creating a large rug or wall treatment, opt for larger stencil motifs for the most impact. 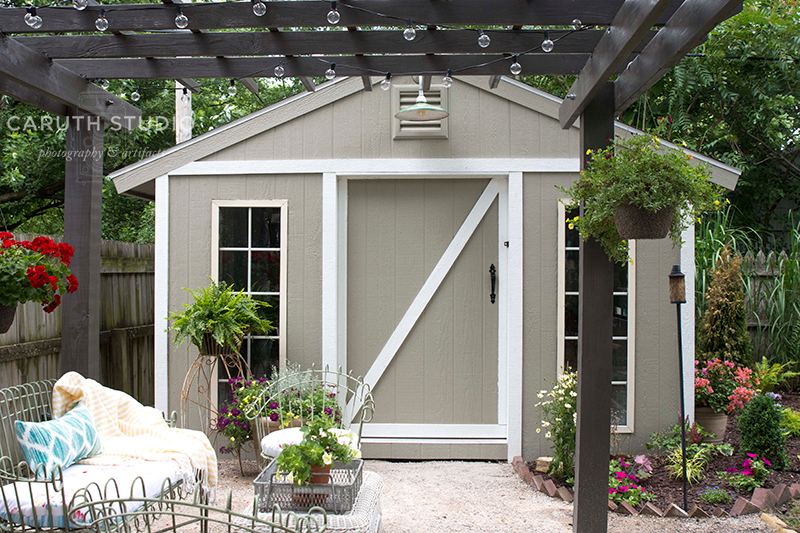 Small or tiny elements will not show as well in an expansive space. Use high contrast colors for the most visible design.